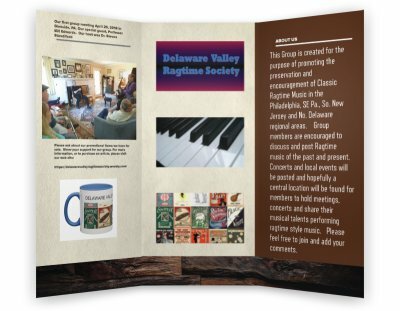 The Delaware Valley Ragtime Society celebrated it's 3rd birthday on July 24, 2018. NOTICE: It appears my Facebook page is not working. If you need to contact me, please use my e-mail: classic.musical.instrument@gmail.com or my phone (215) 853 - 0336. Sorry for any inconvenience. Thank you for your patience. Introducing a NEW feature for our web page. Once a month, we will feature a member of our group, and showcase the talent we have in our group. Christopher Parrish introduces his new musical group, The Saint Louis Ticklers. The members of his group, from left to right: T.J. Muller, Banjo; Sam Golden, Violin; Jon Weiss, Tube; and Christopher Parrish, Piano. His St. Louis Ticklers play a variety of Hot Jazz, Ragtime & Blues for your listening Pleasure! Down on Main Street in historic St Charles! Magpie's has the coolest patio area to eat, drink and hang out at and it has plenty of shade for a sunny day! ATTENTION GROUP MEMBERS: Please provide your e-mail to us, so we can have better communications between everyone. We are working on a newsletter, and would like to share our members specialties and interests via the news letter. Please check your listing here, to be sure we have the most current and correct information. You can use the contact form below to add, update or correct your information. Use the comment section to indicate web pages, your own news letters, phone numbers or any other information you wish to make known. Having your correct e-mail address will assure that everyone will receive our quarterly newsletter. If you have any questions, you may call me directly at (215) 853 - 0336 after 12 noon and up to 12 midnight. Thank you. We welcome you to our webpage. Our group consists of people from all walks of life, who enjoy a wide variety of musical tastes. Ragtime is America's first original music. Ragtime has it's roots in classical music. Jazz and even rock & roll have their roots in ragtime. Gospel piano is even related to ragtime styles. Our goal is to present this musical style to a wider audience. Our group, formed in July 2015, is dedicated to this goal and we cordially invite anyone to join. We are planning a concert, along with other events and we hope to have that sometime as soon as possible. Use the button below to visit our Facebook Group Page. This date marked our first year as a group. For myself, this is a proud moment. Ten (10) years ago, this was only an idea I had in mind. I saw a video of Adam Swanson and Frederick Hodges playing the Maple Leaf Rag, in multiple keys, as a duo at the West Coast Ragtime Festival. Having always loved ragtime, but was never really proficient enough to perform well, I was literally blown away by that video. I found quite a few on Youtube, and was even more astonished and amazed. I shared the videos and my idea, with my friend Jonathan Freeman, a concert artist for whom I did his piano tunings and technical piano work. He encouraged me to go with my idea and start a group. I was still working full time then, so my idea was only a dream. I advertised my idea on several social medias and my own business web page. It was about 3 years before my web page began producing some results. Two years ago, a gentleman by the name of Nick Frankunas emailed me, and stated his interest in being a part of a ragtime group locally. As it is said, the rest is history. We emailed rather consistently over the next year, sharing ideas and thoughts together. I figured the easiest way might be using a social media. I had just joined a Facebook group for Pianocorder owners, and was fascinated at its fast growth. I mentioned this to Nick, and he said he had experience setting up groups on Facebook. I said YES, lets do it. I had originally suggested the East Coast Ragtime Chapter. 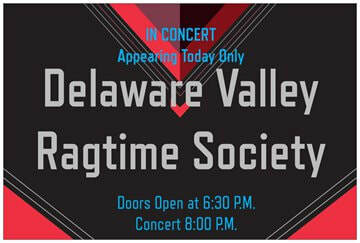 Nick suggested The Delaware Valley Ragtime Society. And we both liked that. 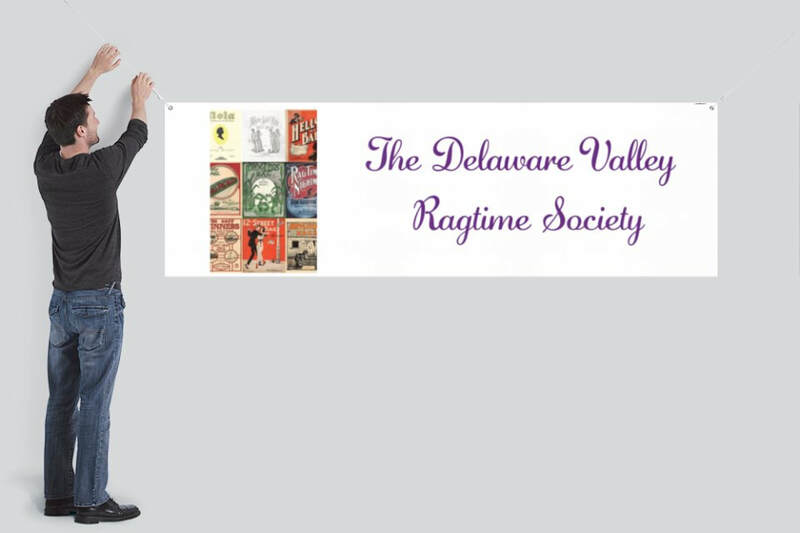 On July 24, 2015, The Delaware Valley Ragtime Society was created with Nick and I as our first two members. ​and we are still preparing for our first concert. Have a great day, and thank you for visiting our web page. We have been having difficulty in obtaining a venue for a concert event. I am considering using a hotel as a concert site. Several considerations include lodging and restaurant facilities for our members traveling a long distance to perform for us. And also a convenient location for a local piano dealer to rent pianos to deliver, set up and tune. There would be plenty of room for personal "booths" for members to sell CD's as well as other items. I am currently working on TWO (2) items for promotional purposes: Group Business Cards and personalized coffee mugs, featuring our group logo. The cards will be printed on both sides, and the coffee mugs will be available in several colors. See the preview below. MUG COLORS are basic white with a choice of 7 different colors as shown to the right: BLUE/WHITE; PINK/WHITE; GREEN/WHITE; RED/WHITE; YELLOW/WHITE; BLACK/WHITE; and ORANGE/WHITE. TWO (2) logo choices are available, the alternate is shown below. 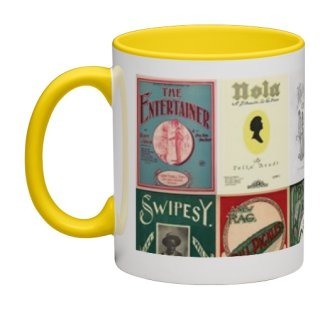 Printing on mugs can be any color of your choice. Or you can have a mug with no printing. ​Alternate logo for imprints on mugs. The front of the business card defines our group. You can have your phone number shown at the top. The back side is personalized to you, as an advertisement for your talents or merchandise. It can be as much or as little as you desire. E-mail me for details and pricing. Mugs are available in 7 different interior/handle colors on a white mug. This is my suggestion for a commemorative mug. You can have your name printed below the logo, or any other printing you wish. Mugs in BLUE, shown above, are also available in 6 additional colors as shown below. We will make available hanging banners, including suction cups for mounting on any smooth surface, for concerts and special events. We also will supply lawn signs for outdoor walking and parking directions. See samples below. Lawn Signs: 27" X 18" Will include (1) holder. Banner: 8 ' X 2.5 ' Fitted with grommets and comes with suction cups for mounting. 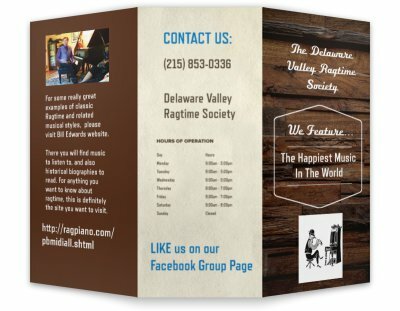 I have designed a brochure for our ragtime society. Here are some photos. I am hoping this brochure will help establish us as a legitimate musical group, and I have included webpages for the reader to be able to access to hear the music. It is a tri fold brochure, and I think it came out very nicely. I have copies available for any member wishing some for handouts or for business purposes to help secure a venue for a concert. Used together with business cards, this puts information about our group in the hands of perspective persons who can help us with our concert plans. I have kept it simple and to the point. I used a rustic format, and a color combination that goes well with the business cards pictured above. * Indicates this member is a performer. + Indicates this member is NOT listed on Facebook. Jonathan Miles Freeman * + e-mail: (private) Not currently on Facebook - call me at 215-853-0336 to contact this member.